Gunnlaugsson goes solo on the abolition plan: beginning of an action plan or end of coalition? In an “overview speech” at his party’s annual conference prime minister Sigmundur Davíð Gunnlaugsson announced today an outline of an abolition plan, short on content – only stability tax mentioned – but long on scaremongering of creditors and their wealth amassed in Iceland, with strikingly wrong numbers. From earlier statements by Bjarni Benediktsson minister of finance, whose remit the capital controls are, it is difficult to imagine he condones Gunnlaugsson’s views. Apart from whether this is a good plan or not it is worrying that the prime minister has lately been quite “statement-happy,” expressing views, which neither Benediktsson nor others have heard of until reported on in the media. Before the Parliament’s summer recess the government will present a Bill to lift capital controls. This is what prime minister Sigmundur Davíð Gunnlaugsson leader of the Progressive party announced at the party’s annual conference Friday. The only concrete measure Gunnlaugsson announced is “stability tax” that according to the prime minister will bring billions of Icelandic króna to the state coffers. As earlier, Gunnlaugsson emphasised the financial gain and the need to remove the new bank’s ownership from creditors. Worryingly, Gunnlaugsson presented wrong numbers and statements, which do not quite seem to make sense or at least rest on some fairly particular interpretation of reality. From earlier statements by minister of finance Bjarni Benediktsson on capital controls it is difficult to see how Gunnlaugsson’s statements fit Benediktsson’s prerequisites of an orderly process based on classic measures, as outlined in Benediktsson’s last status report on the controls (see my take on it here). In addition, Gunnlaugsson has now taken the initiative from Benediktsson. The question is if he did at all discuss his speech with Benediktsson beforehand – allegedly, the two do not spend much time and effort communicating. This in addition to some recent statements from Gunnlaugsson, which have not been discussed with Benediktsson or in the government. Also, there is the report by his fellow party member Frosti Sigurjónsson on monetary systems, another solo initiative by the prime minister. With Gunnlaugsson’s latest statement there have been some speculation if Benediktsson and his party feel to stay in this coalition much longer. However, it might prove tricky for the party to leave without making it look as if they are somehow caving into creditors whereas Gunnlaugsson is gallantly fighting them. Icelanders are slowly learning that whenever the prime minister speaks they glimpse the world according to his “Weltanschuung” – and it does not always seem to rhyme with reality. This is wrong. The claims themselves are around ISK7000bn, the assets of the three estates are at ISK2250bn. As to the interests of this sum possibly being a sort eternity machine to finance the Olympics this hardly adds up. If we postulate that half of the assets are in cash at 1% interest rates and other assets carry 5% interest rates the annual interest rates would amount to ISK67.5bn or ISK270bn, just under $2bn, over four years. Would that be enough to finance the Olympics? The cost of the London games amounted to $14.6bn, ISK2000bn, the cost of Sochi $51bn, ISK7000bn. This is worryingly wrong and far beyond reality. The fact that the prime minister does not know the correct numbers is bad but almost worse that he does not have advisers to enlighten him and find the correct numbers for him. Whoever tried to impress him with the Olympics parallel if clearly not fit to be an adviser on financial matters. Tellingly, all these numbers and the Olympics calculations were diligently reported on Morgunblaðið’s front page today. With all these assets (albeit a wrong number) Gunnlaugsson concluded that creditors would be prepared to go to some length to protect their assets. Who wouldn’t? he asked, considering the sums. Exactly what creditors have done to collect information in Iceland I don’t know but what the prime minister describes here is normal proceedings for doing business in a country (though the psychoanalysis might be rare though by far not unknown): they want to follow what is going on, how it affects their interests and so on. The alarmist tone is somewhat misplaced – creditors would not be pursuing their interests well if they did not keep a close eye on Iceland. It does not matter if it is Argentina, Greece of Iceland: firms want to understand the environment they operate in. “One has to give it to these guys (creditors): they get the main facts right,” said Gunnlaugsson. – Getting the facts right is something less accurate people might try to learn from creditors. According to Gunnlaugsson it was a narrow escape that there were not major mistakes made in 2012 with regard to creditors. He especially thanked “our Sigurður Hannesson,” the MP banker who heads one of the party’s committees, is also on the capital controls’ advisory committee and known to be a close friend of Gunnlaugsson. – Gunnlaugsson did not clarify what heroic deeds were won in 2012; could be the decision to send the Icesave case to the EFTA Court or change in the currency controls legislation, which placed the foreign assets under the controls. Gunnlaugsson stated that after the present government came to power there had been a real turnaround with regard to the capital controls and all earlier plans had been revised. – This work may ongoing but the only official plan in place is the plan presented by the Central Bank of Iceland, CBI, in 2011. I am somewhat at loss to understand the remarks about overprice etc. so I leave it to the reader to find the logic here. I am also unaware that creditors have been trying to drag Iceland into EU but they prime minister may well know more on this than mere mortals. When the road towards the EU had been closed, stated Gunnlaugsson, the government told the representatives of the winding-up boards and the hedge funds that it could not wait any longer. Action will be taken in the following weeks and they will bring the state hundreds of billions of króna, he said. Again, it is difficult to marry this statement with facts. Just recently, the government sent a letter to the EU, apparently intending to break off negotiations. However, the EU says nothing has changed. According to Icelandic officials briefing foreign diplomats in Iceland the letter does not materially change anything. And so on. Linking the recent moves on the EU and the government driving a harder bargain is not obvious, to say the very least. Gunnlaugsson claims the creditors are not putting forth any realistic solution, which now forces the government to act on lifting capital controls. The plan is to do it before the Parliament’s summer recess. – No mention here of winding-up boards sending composition drafts to the CBI without getting answers. As often pointed out on Icelog it is clear that government advisers have for over a year been trying to come up with a plan that could suit the two coalition leaders. Tax is one of the points of disagreement: the prime minister wants to make money on the estates; Benediktsson wants to lift the capital controls according to practice in other countries. It might be difficult to join Benediktsson’s many statements on orderly lifting to the Progressive’s money making scheme. Politically, the Independence party does not feel it owes much to the other coalition party after Benediktsson masterminded the “correction,” Gunnlaugsson’s great election promise of debt relief. By the time the deadline for handing in new parliamentary Bills expired end of March the coalition parties had not found a common ground on important issues regarding a plan to lift capital controls. A government can always make use of exemption to get Bills into parliament but now the thorny topics are being discussed – reaching an agreement has so far eluded the government. With his speech Gunnlaugsson might intend to bring pressure on Benediktsson – as did Benediktsson try to do, albeit unsuccessfully, last year with repeated statements on a plan by the end of the year. According to Gunnlaugsson, with no realistic plans from creditors there is no other way for the government is now forced to launch a plan to lift credit controls before the Parliament ends. The plan is a special stability tax that will bring hundreds of billions to the state, stated Gunnlaugsson. Exactly how it will be applied is unclear but it seems to replace ideas of an exit tax. This tax, together with other action will enable the government to lift controls without endangering financial stability. “It is unacceptable,” said Gunnlaugsson, “that the Icelandic economy is held hostage by unchanged conditions and to have ownership of the financial systems as it is now (i.e. that the two new banks, Íslandsbanki and Arion Bank are owned by creditors).” – This fits with Gunnlaugsson’s earlier ambitions of both getting money out of creditors and ownership of the two new banks. During his years in office the prime minister has time and again made unfounded allegations and presented views he has not discussed with the government. In a recent article in Morgunblaðið MP Vilhjálmur Bjarnason pointed out how unfortunate it was when ministers thought aloud. One characteristic of the prime minister’s statements that sometimes he is not heard or seen for weeks for then suddenly to burst on the scene with views on everything. Gunnlaugsson has accused the CBI of being engaged in politics. And he has accused ministries officials of leaking information, almost on a daily basis, he said. Neither allegations have been clarified or substantiated. He also worried about import of foreign food to Iceland because it could carry with it something that was changing the character of whole nations; he did not name it but seemed to be talking about toxoplasma, which luckily has not had this drastic effect in foreign lands. Most recently, Gunnlaugsson has announced plans to extend the Parliament house by a building sketched by Iceland’s most famous architect, Guðjón Samúelsson (1887-1950) – a house that only exists in a sketch from 1918, the year Denmark acknowledged Iceland’s sovereignty. Gunnlaugsson made this statement of Facebook April 1; when reported in the media it was widely thought to be April fools’ news. Around that time, Gunnlaugsson also said he thought it was a good idea to build a new hospital – a long-running plan and matter of great debate in Iceland – by the Rúv building, thereby introducing a wholly new direction for the hospital. No previous discussion with minister of health or Landspítali management. 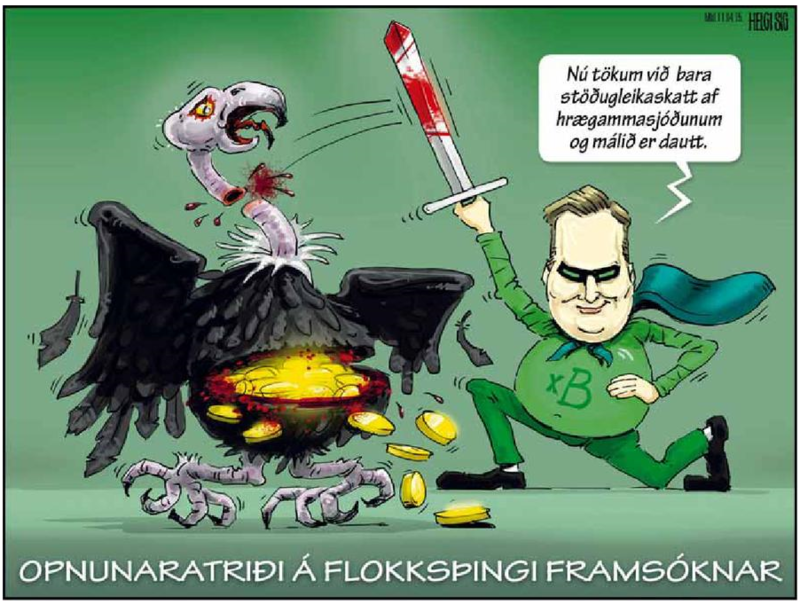 The Icelandic media has now found a name for these unexpected ideas of Gunnlaugsson: “smjörklípa” or “pinch of butter,” meaning that something is thrown into the debate to divert attention. Around the time Gunnlaugsson aired his most recent views one of his party member ministers had been unable to introduce a new housing policy, planned in four new bills. It will come at a great cost, is uncosted, and apparently the Independence party is wholly against it. Another “pinch of butter”: new monetary system in Iceland? Plans to revolutionise the Icelandic monetary system has made news abroad recently but less so in Iceland. The news spring from a new report, written at the behest of the prime minister (as I have already explained in detail in comment to FT Alphaville). In short, this report seems more of a favour to a Progressive party member than a basis for a new and revolutionary monetary system in Iceland. It is indicative of the lackadaisical attitude to form and firm procedures that this report was written at the behest of the prime minister and not the minister of finance, who indeed has never expressed any interest for this topic and has not commented on the report. All those who have been hyper-ventilating in excitement at this bold Icelandic experiment now starting should find some other source of excitement: this experiment has no political backing in Iceland. The Progressive party, whose following has collapsed from 25% in the 2013 election to ca. 10% in the polls, has little political credibility and force to further this cause. I have earlier pointed out that the greatest risk in Iceland is the political risk. It is intriguing that Gunnlaugsson chose to break the secrecy of the capital controls plan at a party conference, where he has to confront a total collapse in voters’ support is intriguing. His rhetoric of fights and battles against the conniving creditors and the party’s and his own earlier prescience is an important element in this respect. With the two party leaders at loggerheads on major topics like the capital controls it is unavoidable that it will come to a confrontation at some point if the government is to take action. The outcome is far from clear. There is great unhappiness among many of Benediktsson’s MPs, whom he incidentally has not trusted recently with cabinet seats. The general feeling is that it is the Independence party, which so far has been carrying out the policies of the coalition partner. Update: minister of finance Bjarni Benediktsson has not yet made himself available to the Icelandic media on his view regarding stability tax. Some members of the opposition have expressed surprise that there is now talk of stability tax instead of the earlier much discussed exit tax. Guðmundur Steingrímsson leader of Bright Future pointed out both the legal risk and risk to the economy were this plan to be pursued. Subscribe to comments with RSS or TrackBack to 'Gunnlaugsson goes solo on the abolition plan: beginning of an action plan or end of coalition? '.